The physical and mental arousal brought on by stress is not always detrimental to performance on a given task. 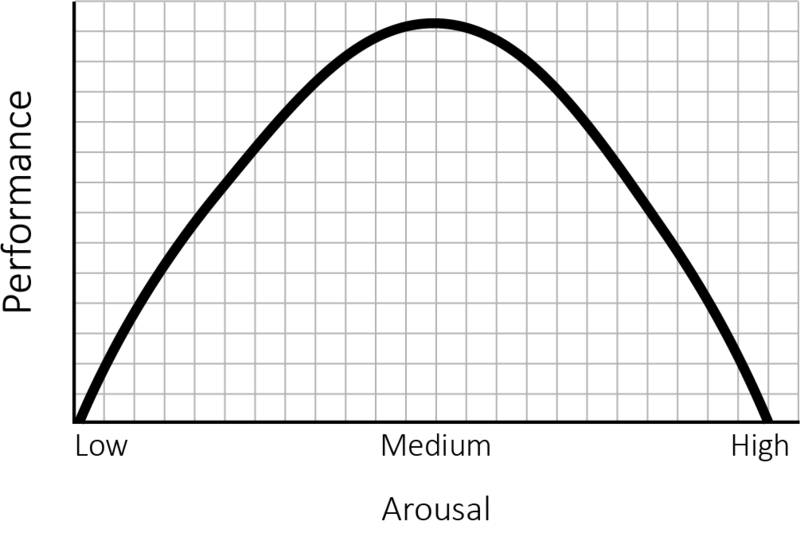 According to the Yerkes-Dodson law (1908), a moderate amount of physiological and mental arousal can actually increase or improve performance. The point at which the arousal becomes too severe and starts to impair performance is when stress becomes a problem. Oftentimes, the stress brought on by a major exam or project in a course can be extreme enough that it impairs the clear thinking needed for optimal performance. Consider the Dos and Don’ts lists below for managing anxiety related to exams. Do prepare for an exam using the “Five-Day Study Plan” in Chapter 5. Students who feel prepared will have less anxiety overall. Do stay positive about yourself and your ability to perform well. Do plan to reward yourself with something relaxing or fun after the exam. Think about that when stressful thoughts may occur. Do relax the last hour before the exam to reduce tension and stressful thoughts. Do eat a moderate breakfast that includes both protein and healthy carbohydrates. Do periodically conduct checks on the tension in certain areas of your body and try to relax those areas. Breathing deeply and engaging in some positive imagery can also reduce tension quickly during an exam. Do survey the entire exam and plan carefully. Do ask questions of your professor if you are unsure about what to do on a particular question. Don’t cram for an exam. Underprepared students naturally have something to worry about. Don’t let negative thoughts or worrying get in the way of clear thinking. If you catch yourself worrying about what you do not know, stop yourself and replace it with positive affirmations and what you do know. Don’t spend time with classmates who might confuse you or generate stress about the exam on the day of the exam. Don’t stay up late the night before the exam. A good night’s sleep will improve your mental state and promote clearer thinking. Don’t drink a lot of caffeine before the exam. Arousal from caffeine can add to stress and make you jumpy. Don’t show up late for an exam. Feeling rushed to finish adds to the stress. Don’t panic if you “go blank” on a question. Go answer other questions and come back to it later. If all else fails, guess or write down what you do know. Don’t resort to looking at anyone else’s paper if you are unsure of your performance. Maintaining your integrity is far more important than the results of this exam. If you feel that you are unable to manage your stress without the assistance of a professional, meet with a counselor in Counseling Services or attend one of their relaxation workshops. Do you experience test anxiety? Rate yourself on these items. From UT Arlington Counseling Services presentation by Ellen Myers on Stress Management, 2002. I am so nervous on tests that I don’t do my best, even when I have studied well and am prepared. My hands get cold and sweaty during a test. I get headaches before or during a test. I have trouble sleeping the night before a test. I find my mind racing or becoming dull and “muddy” so that I can’t think clearly while taking a test. During a test, I forget material I have studied and learned, only to remember it again after the test is over. I “over-analyze” questions, see too many possibilities, choose complex answers, and overlook the simpler, correct answers. I make careless errors on a test. The more checks you put in the “usually” or “sometimes” columns, the greater the likelihood that you may be experiencing test anxiety.